The youth sports culture (especially soccer) is in need of change. The needed change is not one of rules or procedures but culture. The norms and beliefs surrounding youth sports are largely influenced by the adults that administer the delivery of the sport. This article is not a complete plan on how to fix all of the problems. It is the beginning of a conversation to be had on an individual, team, club and national level. Are we giving our children the experience that they deserve? A Zero Sum Game: Look at the Goal Differential table for any league from the Premier League all the way down to a U8 Flight 9, the table always adds up to zero. By this mathematical analysis of soccer, there is balance that delineates some teams as “winners” and some “losers”. By taking this viewpoint, a team that ends up at the bottom of the table receives less from the game than the one at the top. While this may hold true in accolades and trophies, it completely discounts the majority of reasons why young people and adults play soccer in droves every year. Winning is not the point! If it were, then the key to being a successful team or club would be to join the weakest league possible. In Search of Something More: The game is not the result. The game is a process that is intended to bring out more of what makes us human to begin with. Many clubs are fully committed to the Zero Sum Game. Putting all effort into getting better at winning. Replacing players each year with better players, investing in trainers who look to win but not develop and charging a premium price for a sport that is mostly for recreation. The problem with aiming to be at the top of the Zero Sum Pyramid is that the cups that are received there are largely empty. The reason why sports and specifically soccer are so popular is that they can mirror and enhance the human condition. Unfortunately many have fooled themselves into chasing some elusive prize while sacrificing most of the value that they aimed to get from the sport. Although this process of empty cup chasing may be pervasive, it does not need to be. We can go after more. Breaking It Down: Electrical signals and chemical reactions are all that we are looking for. This is taking the human experience down to the smallest pieces but it will bring clarity to what we are doing. The four major chemicals that cause good feelings or “happiness”. The “Selfish” chemicals can be produced without anyone else. Endorphins – Their major purpose is to mask physical pain and are regularly released during physical exercise. Soccer and most other physical exercises are a great source of endorphins. Although endorphins are a great start, their production is only dependent upon the individual. Go for a jog and the same endorphins get produced. It’s a start but soccer is merely one endorphin producer. Dopamine – This is the achievement chemical. It is a reward system for moving closer to goals. It is not particularly linked to physical activity but can be attributed to physical goals. This can be a useful tool for progress but can be an extremely addictive chemical. Dopamine “hits” can be caused by things such as completing a task or achieving a goal. Unfortunately they can also be caused by getting a text or email message regardless of its importance. In our modern culture, no one needs to go out of their way to develop a dopamine addiction. It is everywhere. The “Selfish” Chemicals can be dangerous if they are not kept in balance. The “Community” chemicals are aimed at the survival of humans in a group setting. Serotonin – This is the leadership chemical. It produces feelings of pride and status. Serotonin in the veins increases confidence of the person. Pride and status were extremely important in a hierarchical society. Desire to be acknowledged by the community helps to reinforce the actions that are in the best interest of the group. This chemical helped to strengthen tribes because it biochemically rewarded the individual for putting forth effort in the interest of the common good. The problem in the modern world is that status can be bought and manufactured. It is however an essential ingredient to effective group living that humans have serotonin releases based on real pride. Oxytocin – This is the chemical of love, trust and friendship. There are many ways to get oxytocin. Physical contact is one of the key releasers of oxytocin. Acts of generosity also release oxytocin into the system and encourage more acts in kind. Oxytocin inhibits addiction and boosts your immune system. It is a gradual chemical that builds up over time due to the inherent relationship dynamic. It is the chemical that is released during childbirth that makes mothers feel an overwhelming sense of bond with their newborn. Although our society is interconnected like never before, the separation between us seems to be widening. Good for the caveman but not the modern man. Cortisol – It is the chemical of stress and anxiety. This is the chemical of fight or flight. It prepares the body for dangers that are threatening. Although the release of cortisol into the system can be extremely useful in the short term, its long term use is devastating. The side effects of cortisol release are paranoia about possible threats and inhibition of the immune system. Our present club culture is aimed at systematically creating better soccer machines through the help of the “Selfish” chemicals and Cortisol. The system is ingrained throughout almost the entire country. Teams are formed by annual or seasonal tryouts. Clubs use names like “Elite”, “Select” and “Premier” in order to advertise status. While competition is an integral part of soccer, the club culture is unbalanced in its approach toward the development of our young players (who are more importantly people). In essence we’re trading our human equity to rent falsified prestige. The present club model will create better soccer players over time. The competitive cauldron that we have cast most of our players into will incrementally produce better soccer in the US. While that may be an objective for the USSF and other agencies invested in player improvement, is better soccer without regard for other consequences truly the aim? From a biochemical standpoint, our present club model is relying principally on Endorphins, Dopamine and Cortisol in order to move soccer forward. While this method will be effective in getting players to perform, it is not a fertile field in which to grow confidence, connection, empathy and trust. When viewed from a national level through a soccer lens, these attributes are not particularly the recipe for success. However the majority of our youth who are playing soccer today will not be part of a National Team or a Professional Academy. They will play club soccer through the years of their youth and at some point their playing career will end. Even the longest professional careers only last into the early forties. So the competitive cauldron ends for everyone with the message, “you’re no longer good enough”. Whether early or late the player becomes what we all are on some level, a member of a community. Since they will live a majority of their life interacting with other people and not a ball, it is the interpersonal skills and self-realization that should take precedence in a majority of our clubs. Rather than treating the vast majority of our youth as if they are heading to a storied career of individual glory, focus on the team dynamic and each player’s contribution to that collective. Recognize the level – Teams and clubs can be broken up many ways but in terms of competition: Elite, Competitive Recreation and Recreation. The competitive cauldron has its place but should not be everyplace. If a team or a club is truly “elite”, then they are competing at state or regional level or have a proven gateway to professional ranks. Most teams/clubs are “Competitive Recreation”. Recognizing this fact is a great opportunity for parents, players and coaches to embrace the best of what both worlds have to offer. The moniker of “Recreation” almost has a negative connotation in most sport circles today but it is something that needs to be embraced again. Playing for the joy of the game is not a bad thing. Act appropriately within the level – Elite clubs need to be pushing their players and re-evaluating their talent levels regularly. The level of expectation is higher because the ultimate desired destination is also higher. Most Elite clubs do not have a problem setting this higher expectation. The issue is usually that a club is trying to keep Elite expectations without being Elite. At Competitive Recreation clubs there can be high expectations but the long term growth of the person should supersede the short term desire for “success”. Simple changes like holding tryouts every second or third year would allow players, coaches and parents a period of team building. This long term view allows players and all others involved to develop both on and off the field. Professional trainers are still an option to develop players soccer skills. 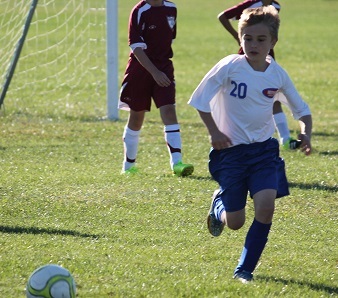 However as we head into a third or fourth generation of soccer players in this country, the knowledgeable parents will begin to make this less of the norm. The Recreation level should continue to be fun with friends. Remember what’s at stake – Often the famous line from Bill Shankly used by people to discuss the sport’s importance. “Some people think football [soccer] is a matter of life and death. I don’t like that attitude. I can assure them it is much more serious than that.” In terms of game results, I would disagree wholeheartedly with Mr. Shankly. Game results are a moment in time that may be remembered or forgotten. However in terms of societal impact, he is absolutely right. This game has the ability to give and take life both literally and figuratively. The passion for the sport has unfortunately taken life in several tragedies. It has also given life by stopping violent conflicts in different parts of the world and giving a pathway to many poor children who would otherwise succumb to their impoverished beginnings. In the US, the game is rarely a matter of life or death. It can be a catalyst toward a better life. Using the game as a vehicle toward better living involves a conscious recognition of short and long term impact of the game on the young person. Pushing all of our youth into a “one size fits all” system of sport kills most of the inherent positives of participation. The conversation does not end here. The difficult thing is not recognizing a problem. People see problems every day but generally wait for someone else to do something about it. The answer is usually much closer to home. Each individual needs to contribute to see the cultural shift that is needed in the beautiful game here in the land of the free and home of the brave. There is a reason why “We The People” are the first three words of Constitution. Change is brought by regular people, doing the right things consistently.